Facilities such as large air-conditioning plants, power plants, steel processing plants, petroleum refineries, or petrochemical plants usually install field erected type cooling towers due to their greater capacity for heat rejection. Field erected towers are usually much larger in size compared to the package type cooling towers. A typical field erected cooling tower has timber, concrete or pultruded fiber-reinforced plastic (FRP) structure, FRP cladding, drift eliminator, fill and air inlet grille and, a mechanical fan arrangement for external air drawing. 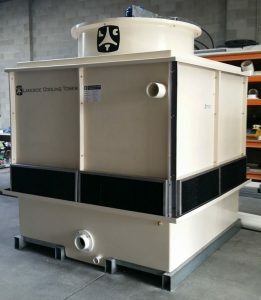 These types of cooling towers are factory pre-assembled, and can be simply transported on trucks, as they are compact machines. The capacity of package type towers is limited by their transportable size and, for that reason, are usually preferred by facilities with low heat rejection requirements such as food processing plants, textile plants, some chemical processing plants, or buildings like hospitals, hotels, malls, automotive factories etc. • Dry cooling towers operate by heat transfer through a surface that separates the working fluid from ambient air, such as in a tube or air heat exchanger, utilizing convective heat transfer. They do not use evaporation. • Wet cooling towers (or open circuit cooling towers) operate on the principle of evaporative cooling. 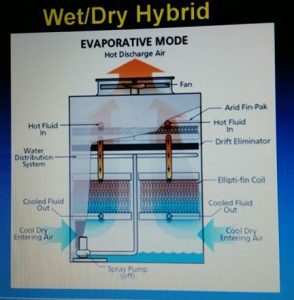 The working fluid and the evaporated fluid (usually water) are one and the same. 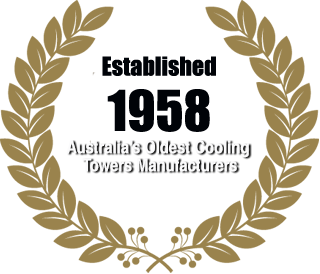 • Fluid coolers/Condensers (or closed circuit cooling towers) are hybrids that pass the working fluid through a tube bundle, upon which clean water is sprayed and a fan-induced draft applied. 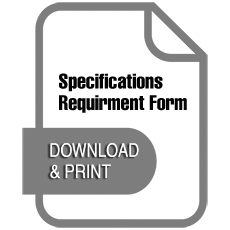 The resulting heat transfer performance has the advantage provided by a dry cooler of protecting the working fluid from environmental exposure and contamination. In a wet cooling tower (or open circuit cooling tower), the warm water can be cooled to a temperature lower than the ambient air dry-bulb temperature. As ambient air is drawn past a flow of water, a small portion of the water evaporates, and the energy required to evaporate that portion of the water is lower than air cooling. Approximately 970 BTU of heat energy is absorbed for each pound of evaporated water (2 MJ/kg). Evaporation results in saturated air conditions, lowering the temperature of the water processed by the tower to a value close to wet-bulb temperature, which is lower than the ambient dry-bulb temperature, the difference determined by the humidity of the ambient air. 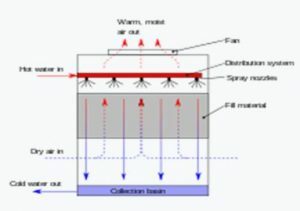 To achieve better performance (more cooling), a medium called fill is used to increase the surface area and the time of contact between the air and water flows. Splash fill consists of material placed to interrupt the water flow causing splashing. Film fill is composed of thin sheets of material (usually PVC) upon which the water flows. Both methods create increased surface area and time of contact between the fluid (water) and the gas (air), to improve heat transfer. • Natural draft — Utilizes buoyancy via a tall chimney. Warm, moist air naturally rises due to the pressure differential. This moist air buoyancy produces an upwards current of air through the tower. • Mechanical draught — Uses power-driven fan motors to draw or force air through the tower. • Induced draught — A mechanical draft tower with a fan at the discharge (at the top) draws air up through the tower. The fan induces hot moist air out the discharge. 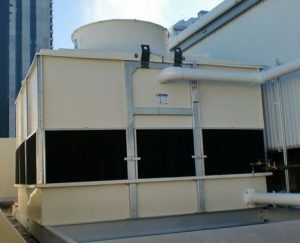 This produces low entering and high exiting air velocities, reducing the possibility of recirculation where discharged air flows back into the air intake. This fan arrangement is also known as draw-through. • Forced draught — A mechanical draft tower with a blower type fan at the intake. The fan forces air into the tower, creating high entering and low exiting air velocities. The low exiting velocity is much more susceptible to recirculation. With the fan on the air intake, the fan is more susceptible to complications due to freezing conditions. Another disadvantage is that a forced draft design typically requires more motor horsepower than an equivalent induced draft design. The benefit of the forced draft design is its ability to work with high static pressure. Such setups can be installed in more-confined spaces and even in some indoor situations. This fan geometry is also known as blow-through. • Fan assisted natural draught — A hybrid type that appears like a natural draft setup, though airflow is assisted by a fan. Hyperboloid (sometimes incorrectly known as hyperbolic) cooling towers have become the design standard for all natural-draft cooling towers because of their structural strength and minimum usage of fan energy which is offset by the requirement of powerful water circulating pumps. The hyperboloid shape aids in accelerating the upward convective air flow. These designs are popularly associated with nuclear power plants. However, this association is misleading, as the same kind of cooling towers are often used at large coal-fired power plants as well. Conversely, not all nuclear power plants have cooling towers, and some instead cool their heat exchangers with lake, river or ocean water. 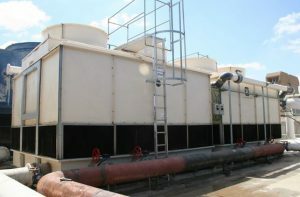 These are also known as Combinair and can be Crossflow or Counterflow cooling towers that incorporate a heat exchanger at the air discharge outlet of the cooling tower. 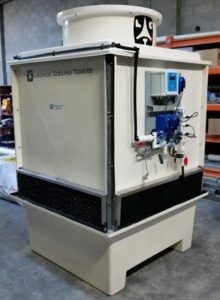 The saturated warm air discharge flows through the heat exchanger through which water is circulated and provides pre- heating of water used for numerous process requirements hence providing energy savings and what is also known as co-generation. Thermal efficiencies up to 92% have been observed in hybrid cooling towers. Crossflow is a design in which the air flow is directed perpendicular to the water flow (see diagram above). Air flow enters one or more vertical faces of the cooling tower to meet the fill material. Water flows (perpendicular to the air) through the fill by gravity. The air continues through the fill and thus past the water flow into an open plenum chamber and finally out into the atmosphere. A distribution or hot water basin consisting of a deep pan with holes or nozzles in its bottom is located near the top of a crossflow tower. Gravity distributes the water through the nozzles uniformly across the fill material. • Gravity water distribution allows smaller pumps. • Fan and motor accessible from top deck. • Internal walkway for access to fill. • More prone to freezing than counterflow designs. • Variable flow is useless in some conditions. • More prone to dirt build-up in the fill than counterflow designs, especially in dusty or sandy areas. 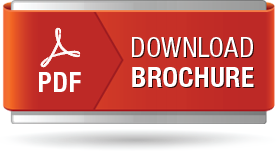 • Larger Site footprint requirement. • Inaccessible for internal inspection during operation. • Noisier than counterflow type. In a counterflow design, the air flow is directly opposite to the water flow (see diagram). Air flow first enters an accessible area beneath the fill media, and is then drawn up vertically. The water is sprayed through pressurized nozzles near the top of the tower, and then flows downward through the fill, opposite to the air flow. • Spray water distribution makes the tower more freeze-resistant. • Breakup of water in spray makes heat transfer more efficient. • Access for inspection whilst working. • High velocity fully saturated air discharge- detracts from recirculating. 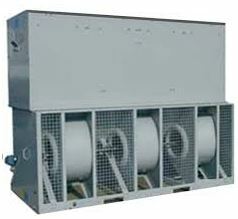 • Can be used in natural draft cooling towers. Older design can be noisier, due to the greater water fall height from the bottom of the fill into the cold-water basin. Can be used in enclosed areas with a single air intake. Tend to recirculate fully saturated discharged air causing performance failure. Poor access for maintenance. 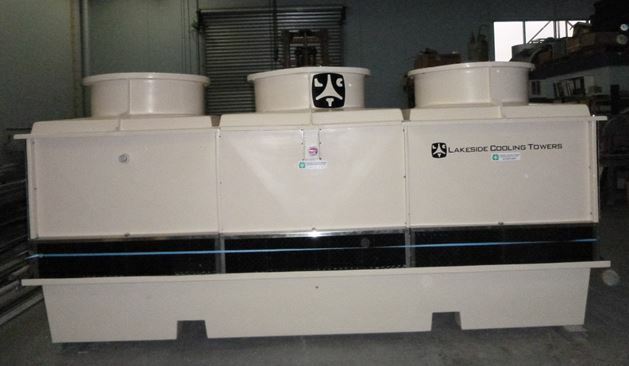 Standard centrifugal fans corrode and disintegrate due to chemicals in the water treatment. Difficult fans replacement. Fan drive belts require maintenance or replacement. Closed circuit types’ water coils are subject to corrosion and difficult to repair. • The interactions of the air and water flow allow a partial equalization of temperature, and evaporation of water. • The air, now saturated with water vapor, is discharged from the top of the cooling tower. • A “collection basin” or “cold water basin” is used to collect and contain the cooled water after its interaction with the air flow. Quantitatively, the material balance around a wet, evaporative cooling tower system is governed by the operational variables of make-up volumetric flow rate, evaporation and windage losses, draw-off rate, and the concentration cycles. In the adjacent diagram, water pumped from the tower basin is the cooling water routed through the process coolers and condensers in an industrial facility. 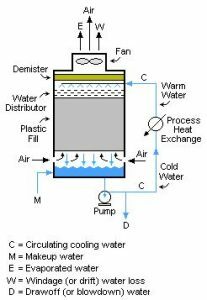 The cool water absorbs heat from the hot process streams which need to be cooled or condensed, and the absorbed heat warms the circulating water (C). The warm water returns to the top of the cooling tower and is sprayed downward over the fill material inside the tower. As it trickles down, it contacts ambient air rising up through the tower either by natural draft or by forced draft using fans in the tower. That contact causes a small amount of the water to be lost as windage/drift (W) and some of the water (E) to evaporate. The evaporation of the water cools the water back to the basin. The water is then ready to recirculate. The evaporated water leaves its dissolved salts behind in the bulk of the water which has not been evaporated, thus raising the salt concentration in the circulating cooling water. To prevent the salt concentration of the water from becoming too high, a portion of the water is drawn off/blown down (D) for disposal. Fresh water make-up (M) is supplied to the tower basin to compensate for the loss of evaporated water, the windage loss and the draw-off water.